OCZ is one of the leading and famous manufacturers in SSDs, has expanded its catalog with new series thick OCZ Vector SSD which is remarkable for its great performance and the manufacturer’s own driver. No doubt, that all ultraportable computing devices going to opt SSD in them for performance and design purpose, all manufacturing vendors are trying to bring more efficient drives and slim in design and this all new OCZ Vector SSD series is a best example of this. 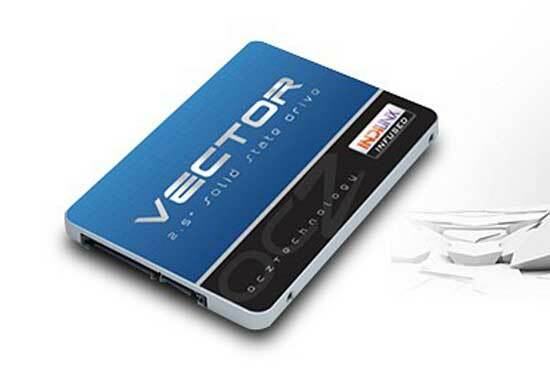 The new OCZ Vector SSD uses NAND Flash MLC, Indilinx Barefoot controller 3, SATA 6 Gbps interface and 2.5-inch form ultra-slim 7 mm. OCZ Vector SSD performance is superb as data transfers reaching 550/530 Mbytes per second in still read / write 4K random writes and 100,000 IOPS , the highest we’ve seen in consumer units. Moreover, these OCZ Vector SSD series drives have got five year warranty and are available in storage capacities of 128, 256 and 512 Gbytes with prices ranging from 160 to 570 U.S. dollars. This was all regarding OCZ Vector SSD stay tuned for more updates regarding these cool solid state drives.